The new facility will be located in Lille, France. French construction firm Rabot Dutilleul has been retained by the city of Lille to develop an expansive, eco-friendly natatorium. Designed by German architects Auer Weber, the future facility, set to feature a 42.5-metre diving pool – the deepest in the world – will also comprise three swimming pools, a restaurant, a balneotherapy area, and a wellbeing centre with cryotherapy, sauna, and steam room facilities. 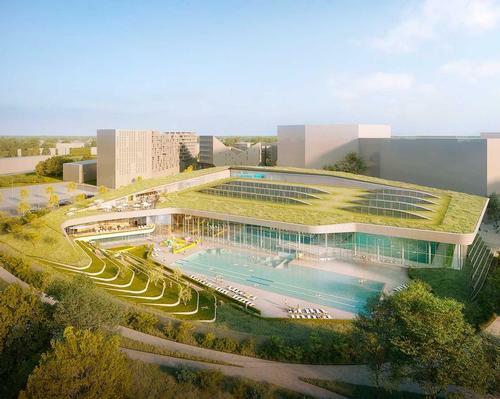 Another highlight of the €78.5m (US$89m, £68.7m) recreational complex will be its 8,000 sq m green roof, an energy-efficient leisure space that will double as a miniature park. Commenting on the project, Damien Castelain, president of the Métropole Européenne de Lille (MEL), said: "This new sports facility focuses on the environment, taking into account the key issues of energy consumption, water consumption, and the conservation of biodiversity." He continued: "I am delighted with this decision, which will lead – in 2021 – to the construction of a facility that combines quality services for urban citizens and respect for the environment." The new attraction is expected to welcome an estimated 550,000 visitors annually. Construction on the project is slated to commence in November.